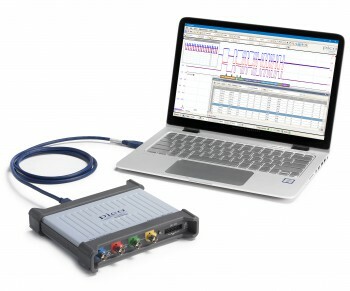 Pico PC oscilloscopes, like most digital storage oscilloscopes (DSOs), include an equivalent-time sampling (ETS) feature. ETS allows a digital oscilloscope to capture high-frequency signals with a much higher effective sampling rate than the sampling rate of the ADC itself. Equivalent-time sampling constructs a picture of the input signal by accumulating the samples over many wave cycles. Because ETS samples the waveform over a number of cycles, it can only be used to measure signals that are repetitive. ETS cannot be used for single-shot or non-repetitive signals – for these signals, you need a scope with a sufficiently high real-time sampling rate. Figure 1 shows a 25 MHz sine wave that was captured using a Pico handheld oscilloscope using a real-time sampling rate of 100 MS/s. Figure 2 shows the same 25 MHz sine wave sampled using digital ETS. From these waveforms you can see that the real-time sampling gives a wave shape so distorted as to be nearly useless, while ETS gives a much more accurate representation of the input signal. On repetitive waveforms, a Pico oscilloscope with equivalent-time sampling can provide the same accuracy as higher-cost oscilloscopes that have higher real-time sampling rates.